CD's friend June (I miss your blog, June) brought some wonderful blueberry muffins to work recently and CD just couldn't stop talking about how good they were. 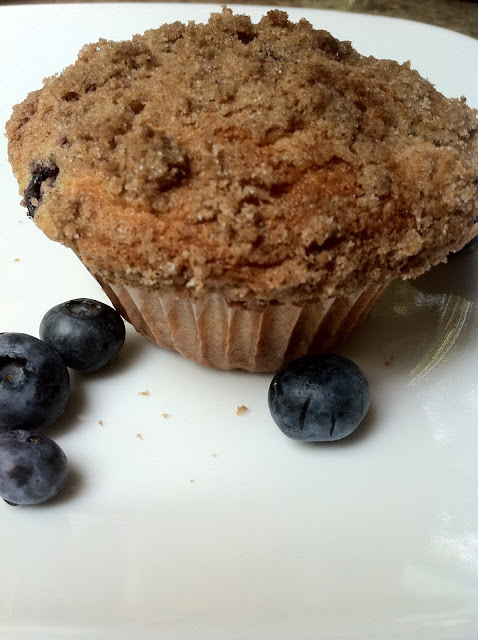 Blueberry muffins are one of JC's favorite breakfast food so he decided to make them . . . there are not enough superlatives to describe these beauties. They are light, full of gooey blueberries and have a crunchy streusel topping. Here's the link: To Die For Blueberry Muffins. Make these. You won't regret it!! Your picture is very pretty!!! I told myself after I tasted one of those blueberry muffins that I would never buy another coffee shop blueberry muffin again! They are so good! They are really good. It took me 2-1/2 of them to confirm.